Buying a timeshare property may have seemed like a good idea when you signed the timeshare contract. But if you’re taking yet another “staycation” this summer – and really haven’t been able to travel as much as you’d like the rest of the year as well – you may have realized that you aren’t truly benefiting from your timeshare purchase. Some people buy timeshares as potential investments. But that’s often an unwise move, since timeshares aren’t investments in the traditional sense, and they don’t offer the typical benefits that, say, stocks or bonds might, such as price appreciation or dividends. Many timeshares also don’t function as traditional real estate investments either, since most timeshare buyers only own a specific and limited portion of a property for a specific week or month during the year. That’s why most people enter into a timeshare agreement simply to enjoy the privilege of having a vacation home at their disposal. Owning a timeshare, however, comes with a lot of inherent financial risks and may not always be your best economic move – especially in a slow economy. Fortunately, you do have some options if you’ve signed a timeshare agreement and want to get out of it. You need to determine whether you have a deeded timeshare or a leased timeshare property. A deeded timeshare bounds you to the contract as an exclusive owner, while the leased timeshare means you are only the owner for a set number of years. If you have a deeded timeshare, you have the option to sell it to someone else. If you have a leased timeshare, you may have to keep paying your annual fees until the lease expires. If you know you aren’t going to be using your timeshare for a certain period of time, consider renting it out to somebody as a vacation rental for extended stays. In some cases, the rental fees you earn will be able to cover the annual maintenance fees you must pay on the timeshare. Just remember that, regardless of whether you use the timeshare or rent it to someone else, you’ll still be responsible for maintenance costs and other fees as outlined in your initial timeshare agreement. Check in with the company that manages the property. Some timeshare companies offer services for those who are interested in selling their timeshare, and they may even help to match you up with an interested party. They may charge a fee for this service – which will come out of the final sale price – but this could be an easier way to get that timeshare sold. With some timeshares, your annual fees may have escalated to the point where you’re not getting much value each year from the timeshare, or you could simply pay to go to another resort and come out cheaper. If high annual fees are the issue, ask your timeshare property management company for permission to deed back your timeshare to the organization. With a “timeshare deedback,” you basically agree to give your timeshare back to the resort. Advertise your timeshare property for sale. If you are under a deeded timeshare agreement and decide to sell the timeshare on your own, consider posting your property on reputable site like TUG, the Timeshare Users Group. TUG offers a wealth of practical, consumer-friendly information for both existing timeshare owners and would-be timeshare buyers. Among the features at TUG are a “Timeshare Marketplace” that lets you sell or rent your timeshare free of charge; a wealth of advice articles about timeshare ownership; and an online forum where you can ask timeshare questions and get answers. Best of all, TUG provides its members with a sales history database, so you can get the most recent, up-to-date information on timeshare sales and properly assess how much your timeshare is worth. Aside from TUG, you can also place classified ads for your timeshare on sites like Craigslist and eBay. Never pay an upfront fee. Be careful about working with certain companies that offer to “help” you sell your timeshare. Some of them make lots of upfront promises about getting you fast money for your timeshare, but they may charge high listing and sales fees and really not do much more than post Internet advertisements for your timeshare. Even worse, many timeshare re-sellers will insist that you pay an upfront fee to unload your timeshare. They may call this a “marketing charge” or a “listing fee;” some may claim it’s a required cost to do an “appraisal,” a “title search” or something else altogether. Whatever the fee is labeled, don’t fall for it. You should never, ever pay an upfront charge to someone to sell your timeshare. It’s just asking for financial trouble and the potential loss of your money. In fact, some places asking timeshare sellers to pay upfront fees are outright scams. Still, because a timeshare-reselling agent acts as a third-party between timeshare owners and sellers, some people think that using a re-seller can speed up the sales process. Recognize that any re-seller will charge a fee for his or her services, and this is typically charged as a percentage of the sale. Also realize that even if you sign over a power of attorney giving someone else the right to sell a timeshare on your behalf, you nonetheless remain the legal owner of the timeshare and are financially responsible for it until the timeshare actually sells. Many homebuyers mistakenly arrive at closing unprepared for a laundry list of closing costs: major and minor fees that are a routine part of any home purchase. This can be because the lender increased fees on lender-controlled aspects of a transaction, or because a buyer chose a third party (appraiser, inspector, attorney, title company) that might charge higher prices than those estimated by the lender. Before you make an offer on a home, discuss with your agent whether you can negotiate with the seller to pay some or all of your closing costs. Many buyers who are stretching to finance a down payment make an offer that’s slightly higher and ask that, in exchange, the seller pay some or all of the closing costs. (Essentially, this amounts to financing closing costs within the mortgage loan.) Sellers eager to complete a transaction may offer to pay some closing costs in order to expedite a deal, or price their home slightly high on the assumption that they’ll be helping a buyer with closing. If a seller commits to pay some or all of the closing costs, Cecala recommends getting it in writing and appending the seller’s commitment to HUD loan documents so that the seller is held to their promise. Make sure you get — and carefully review — the Good Faith Estimate that your lender must provide within three days of your loan application. This paperwork will describe to you the closing costs associated with your loan, ranging from lender-related fees (such as loan origination fees) to outsiders’ fees required to complete your transaction (inspection, appraisal, etc.). A good faith estimate is just that — an “estimate” — and some closing costs cited in that estimate can change. But as of January 2010, the government made it illegal for some of those costs to rise and capped other cost increases at no higher than 10 percent. Closing costs that cannot increase include points (once an interest rate is locked), loan origination fees and transfer taxes. The costs that can increase, but by no more than 10 percent, include any services required by a lender, title-related services, and government recording charges. Other closing costs that can change include services that the buyer selects, such as extra home inspections, title services not required by the lender, homeowner’s insurance, and escrow deposits. Because lenders all use the same form to provide customers with the closing cost numbers, it’s possible to compare the estimates of various lenders, and to negotiate with them on some fees. Ask that your lender to provide the HUD-1 Settlement Statement well before closing, so you can comparing the closing costs listed in the statement with your Good Faith Estimate. You should feel free to ask your lender about any discrepancies or price adjustments you notice, so that you’re prepared and well-equipped to close with confidence. “You do have recourse after the loan closes if you find out you’ve been overcharged,” says Cecala. Bank note: If you’re closing on a house or condo it’s called a mortgage. If it’s for a co-op it’s called a security agreement. The security agreement or mortgage “puts teeth into the note.” A note is a piece of paper that says I borrowed the money and I will promise to pay it back. The security agreement or mortgage says what the bank will do if you don’t pay it back. Aztech: For a co-op, it’s a recognition agreement. The bank has a security interest in the shares but the coop also has a security interest in the shares. The recognition agreement is signed by the bank, co-op, and the borrower/buyer, recognizing each others’ mutual security interest in the shares. Lead paint disclosure: The seller, buyer and usually the agent all sign. Most people waive their right to do a lead paint inspection. Attorney’s fees: Fees attendant to the loan, including the bank attorney’s fees. Transfer agent fee: If the co-op has a transfer agent, the transfer agent gets a fee to review the recognition agreement; condos also sometimes have have transfer fees. Co-op charges: Charges can include a move-in fee and a transfer fee; co-ops come up with all kinds of fees. New York State Mansion Tax or mortgage tax: If you’re buying a home in New York State, and the sale price is over a million on any residential house, you will pay a mansion tax. If the sale price is under a million, you’ll pay a mortgage tax. Title charges: (for a condo or house) pays for the title report ordered by the lawyer. It’s a onetime insurance premium you’re paying for the title. It’s a research of the property to find any and all encumbrances. The seller has to secure all the claims against a property to close. The title company is ensuring that the buyer has a good, clean, marketable title to that home or condo. Check every angle, and take advice, no matter how polished and plausible the other side seems. Many Israelis are now buying and selling American real estate, trying to take advantage of a strong shekel and a weak United States real estate market. However, real estate scams are probably as old as real estate itself, and savvy investors can make mistakes, especially if they are deceived by their attorneys and real estate advisors. With investors pooling their money into real estate trust funds, there are multiple opportunities for con artists to conceal theft from the trust fund. As the trust fund managers collect monies from an ever-increasing circle of clients, they pay out “dividends” based not on returns, but on new investments. In one real estate ponzi scheme, investors purchased deeds (interests in land) that were marketed as being secured by California real estate. In fact, the deeds were either unsecured or far more risky than promised. Many of the “investment counselors” were not licensed as required, and the appraisals were inflated. The ponzi scheme promised rates of return of 18% to 22%, with loans not exceeding 80% of the value of the property. It was all a multi-million dollar fraud. In another case, a Harvard Law graduate, who was a former US Attorney, teamed up with a tax shelter specialist to defraud property owners. The owners provided a limited power of attorney over two residential properties to a relative of the tax shelter specialist. The attorney promised that the relative with the power of attorney was as honest “as the day is long.” A short time later, while the owners were in Israel, the “honest” relative and various acquaintances obtained outside loans on the properties and moved another relative into one of the homes. When the property owners demanded to be made whole, the scam artists threatened to “grind the owner into the ground.” And, when the owners took legal action, the attorney had another tenant manufacture a claim of sexual harassment against the owners. Sometimes, an enterprising buyer will pay a small deposit to tie up a property in escrow, perhaps for ninety days, while looking for another purchaser. When the transaction closes, the original seller is paid by the ultimate purchaser through the escrow. This kind of transaction is sometimes referred to as a “double escrow,” and often the original seller has no idea about the additional premium collected by the middleman. This arrangement can become fraudulent where the attorney represents multiple parties in the transaction and conceals the facts from the seller. Generally speaking, attorneys only represent one side in a transaction, especially in a real estate transaction, to avoid conflicts of interest. The attorney should disclose all the facts about the transaction and obtain written consent. A real estate scam artist often has a certain flair. The scammer gains the confidence of the victim with brash self-assurance and by displaying badges of success: money, cars, and an impressive home. Then, the scammer confuses the investor with a get-rich-quick scheme that is incomprehensible, yet delivered with such bravado that otherwise prudent, successful people write enormous checks to buy something they do not understand. As a young attorney, I remember sitting in a meeting with a brilliant transactional and tax lawyer who was being sued for fraud in Los Angeles. He was dazzling. He had the entire defense team in the palm of his hand. We thought he was a genius, we admired his character, and we could not believe that he had done anything wrong. As the case proceeded closer to trial and after the defense team considered the evidence, it became clear that, like the investors, we had also been fooled. Some simple rules apply: Understand how the transaction works: what is being bought, what is being sold and how the investment makes money. If it looks too good to be true, it probably is. Be careful about trusting strangers. A power of attorney is a potentially dangerous instrument. Finally, always have qualified third parties, who are not interested in the transaction, review the deal. Nathan D. Wirtschafter, Esq. is a California attorney. HUNTSVILLE, Alabama — Mayor Tommy Battle called Thursday night’s downtown ideas summit a “continuation of a conversation” started by Huntsville’s earliest residents in the 1820s. But it’s a safe bet that the city’s founders never talked about Wi-Fi accessibility, electric car charging stations and skydiving tunnels. Those were among the more than 500 downtown improvement ideas submitted by the public over the past month on the city’s website, huntsvilleal.gov, and Facebook page. A standing-room-only crowd packed the Big Spring Partners building on the courthouse square Thursday to hear Battle reveal the most popular suggestions. A permanent sidewalk market was the top vote-getter, followed by a unique skyscraper to transform the skyline, SmartCode zoning and a downtown greenway or riverwalk. The No. 5 idea drew chuckles from the crowd: move Huntsville City Hall, which hogs a chunk of prime real estate overlooking Big Spring International Park. 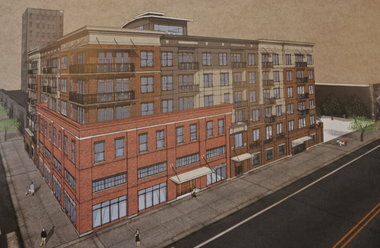 One voter recommended turning the eight-story building into a boutique hotel. Many other ideas landed just outside the top five: a late-night diner, better public transit, commuter rail service, a fountain depicting Huntsville’s role in space exploration. In response to an audience question, Battle said one idea on the list – a new downtown ballpark – has been batted around recently. He said a developer suggested that the city sell the Joe Davis Stadium site to Walmart, which would like to open a megastore around Airport Road, and use the proceeds to build the Huntsville Stars a new home downtown. “It’s an interesting thought,” Battle said. Another idea mentioned Thursday — more affordable downtown housing — may be the closest to reality. Husband-and-wife developers Charlie and Sasha Sealy held a groundbreaking ceremony last week for their $11.5 million Belk Hudson Lofts project. The couple is turning the vacant Belk department store building on Washington Street into a 75 loft apartments renting for $850 to $1,3000 per month. The city is paying them $450,000 over five years to leave the building’s Depression-era outer walls intact — a development incentive known as a facade easement. The city is also looking at SmartCode zoning, which puts a premium on walkable neighborhoods where homes, schools, shopping and workplaces mix comfortably. Providence was this area’s first SmartCode development. Acting Planning Director Marie Bostick said the city has no restrictions on building heights right around the courthouse, making a cloud-skimming skyscraper a future possibility. However, there’s a three- to five-story limit on streets where downtown meets Twickenham and Old Town. Battle said whatever happens downtown should not “step on the toes” of people living in the nearby historic neighborhoods. MCLEAN, Va., July 18, 2011 /PRNewswire/ — Freddie Mac (OTC:FMCC.ob – News) released today its U.S. Economic and Housing Market Outlook for July showing the housing market, buffeted by a recovering rental sector, is unlikely to experience a “double dip”, and will likely follow the performance of the overall economy for the remainder of 2011. Additionally, home sales are still projected to be up over 2010’s pace by 3 to 5 percent. Nonfarm payroll employment rose a scant 18,000, following a downward-revised 25,000 in May. In June, private sector job growth had slowed to a 57,000 gain for the month, largely offset by the continued downsizing of state and local payrolls. The unemployment rate ticked up for the third consecutive month to 9.2 percent, the highest in six months. The sluggish job update likely reflects a temporary “soft patch” in the economy rather than foreshadowing an inflection point in gross domestic product (GDP) growth. Despite record levels of home buyer affordability and historically low mortgage rates, households remain concerned over their financial futures and are holding off on major purchases, particularly homes. The rental housing market, continued to show the clearest signs of a turnaround with the Apartment Property Price Index showing a 15.2 percent gain over the year through the first quarter of 2011. After clear weakness in national price metrics through the first quarter, the FHFA Purchase-Only House Price Index for the U.S. was up 0.8 percent in April compared with March, and the S&P/Case-Shiller 20-city composite index registered a monthly gain of 0.7 percent (not seasonally adjusted) in April, the first positive monthly sign in eight months. Click here to view the complete July 2011 U.S. Economic and Housing Market Outlook. Freddie Mac compiles data on major economic and housing and mortgage market indicators and offers forecasts based on those indicators. Attributed to Frank Nothaft, Freddie Mac, vice president and chief economist. Freddie Mac was established by Congress in 1970 to provide liquidity, stability and affordability to the nation’s residential mortgage markets. Freddie Mac supports communities across the nation by providing mortgage capital to lenders. Over the years, Freddie Mac has made home possible for one in six homebuyers and more than five million renters. NEW YORK — U.S. home builder sentiment rose more than expected in July but remained near historic lows, the National Association of Home Builders said on Monday. The NAHB/Wells Fargo Housing Market index rose to 15 in July after falling to a nine-month low of 13 in June, the group said in a statement. Economists polled by Reuters had predicted the index would rise to 14. Readings below 50 mean more builders view market conditions as poor than favorable. “The improvement in builder confidence in July is a positive sign that the outlook perhaps isn’t quite as bleak as was feared in June,” said Bob Nielsen, chairman of the NAHB, in a statement. While builders continue to struggle with competition from cheap foreclosed properties and a restrictive lending environment, Nielsen said consumers in some markets are beginning to take advantage of good buying conditions. WHY DO SOME PEOPLE SUCCEED IN REAL ESTATE WHILE OTHERS FAIL? There are 5 pillars to success in this current day and age and the chances are, you’re just missing an element from one of those pillars. That may be different than what you’ve heard in the past, and you may be thinking… but what about “money“. Well, in just a moment, you’ll see why the money will take care of itself when you have the rest of the pieces in place. Let’s look at each of these . But I also realize that most people simply won’t do it. But there are other things you can do to change your attitude. You’ve got to understand that it is something you’ve got to work on EVERY DAY of your life because things are going to get in the way and there are going to be days where things just come up and you have to deal with lots of fires. It’s called life! You have to get off the couch, and I mean that literally. No one is going to do it for you. I was watching this TV show the other night that had a woman who wanted to lose a lot of weight and change her life by becoming a healthier person. At the beginning of the show she weighed 433 pounds. 6 months later she weighed 333 pounds, and although this was a big accomplishment, her trainer who had installed a surveilence camera in her house to monitor her progress caught her sitting on the couch eating a bag of chips. This of course could have been a minor setback or a major one. She chose to not let it get in the way of what she wanted. She made a choice to obtain her goal. There was no place for self pity. She made the decision to turn off the pity party faucet and that was that! You can do the same thing and I encourage you to do whatever it takes to make that mental shift in your head. Just remember, it’s a PERSONAL commitment. You can tell 1001 people whatever you want, but you won’t see real change until you have a heart to heart talk with yourself and decide that enough is enough. Next we have “knowledge“. This is a tough one because we almost ALWAYS feel that there’s more to learn. But there’s a pretty good chance you’ve got all the “knowledge” you need OR you have the access to it at a moment’s notice. You will NEVER know all there is to know about anything. Stick with one thing and work that. It’s not worth the mental energy you exhaust trying to keep up with everything. Trust me… I know this from experience. I’ve got 10s of $1000s of dollars of “programs” I’ve never gotten around to. It’s easy to second-guess yourself or to think you just ought to give up, but belief is CORE to your success. If you don’t believe in yourself, no one else will. This is where the “money” takes care of itself. If you’re passionate and have the belief, everything else comes into play where it needs to. This is another challenge for a lot of people nowadays. We pride ourselves in being able to do 5 things at once and by how much we can get done. Here’s the dirty ugly secret about multi-tasking: It doesn’t work! You can only do one thing well at any given time. Your brain can only focus on one thing at a time. So, if you’re watching a webinar, for instance, and checking your email, you might as well turn one off because neither is getting the attention it deserves. You’ve got to focus and focus hard for anything to be successful. I suspect a lot of us lack focus because as entrepreneurs, we’ve got to do SO much in the very beginning that it’s sort of a way for us to avoid the things we don’t want to do. I call it productive procrastination. But, it just doesn’t work. If there’s something you don’t want to do, can’t do, or won’t do, figure out how to offload it. It’s going to keep you from focusing on what you really DO well. This might sting a little! Most people are not successful because they lack determination. Determination is not simply, “I’d like to be rich and I just hope that one of these days I’ll find the right info-product that has the magic button”. There is NO magic button. Nobody is going to literally do all the work for you and then deposit millions of dollars into your bank account. I hate to break it to you, but that’s just life. You’ve got to put in effort, a lot of effort. You have to do things that you don’t want to do sometimes – at least until you can afford to hire someone else to do those things for you. You’ve got to get your goals out in front of you and not let anyone get in your way. You’ve got to find solutions when problems arise, not excuses. You’ve got to work through the challenges when they arise in order to get results. With rents climbing and rentals in high demand, investors are being lured to investment properties, taking advantage of low housing prices and interest rates. In case you haven’t noticed, there’s a crop of young, willing, and able future buyers who seem to have their heads buried in their smartphones. Their phone is their world, but they prefer texting to talking. How can you get their interest — and their business? QR (Quick Response) codes were invented in Japan by a subsidiary of Toyota Motor Corp. to help identify car parts. Once people recognized their flexibility of encoding links to the Web, they took off in Japan and other East Asian countries. (This is perhaps unsurprising, as mobile Web access is much more common in that part of the world than in the United States.) In fact, you will find QR codes plastered on billboards, signs, storefronts, and just about any place you look in all the major Japanese cities. Think of the QR code as a two-dimensional barcode that can contain many different kinds of information and present that information in many different ways. QR codes can be read instantly from any number of free smartphone apps. The opportunities for real estate marketing are nearly endless since one of the main uses of QR Codes is to embed URLs that when scanned will take the phone user to wherever the URL was pointing (i.e. your Web site, listing detail information, etc.) They effectively turn anything they are printed on into an active and track-able hyperlink. Where to place them for maximum exposure and impact. If you do a Google search on “QR code generators,” you’ll find dozens of sites that will create them for you at no cost. My favorite is a site called BeeTagg QR Generator, which allows you to create any number of QR codes in different formats for free. Now, this next part is very important. Of the six different download options shown, there are only two you will typically work with. Select Gif if you plan on placing the code on a Web page or e-mail, and Eps if you plan on using it in print. GIF images are the smallest file sizes for this kind of image and are ideal for placement in Web pages. However, they are not good for print or other media because they don’t scale well. That is, they get blurry or pixelated if you try to blow them up beyond their original size and will become unreadable by the smartphone apps. The EPS file format is ideal for print media because it can scale to any size (including 16-foot billboards) without any loss of fidelity. Publish a print ad with a QR code pointing to a YouTube video of you walking through your latest listing. If it is winter, develop a QR code on the sign rider and link it to photos or a video of the house when the landscaping is in full bloom during spring or summer. Sponsor a local team and put the QR code pointing to your Web site on their uniforms. Give away T-shirts with QR codes on them that point to your site. If you send out calendars each year, put a QR code pointing to your Web site on every page. Conduct a QR code open-house “scavenger hunt.” Put a code in print or Web ad for a series of open houses where the code on each home maps you to the next one. Participants have to read them all to get to the prize at the final house — a great idea for a broker open tour. Put a QR code pointing to your Web site on the back of your business card. Just click on the link in the image above and see how it takes you to a page that fully explains what QR codes are and their benefits to the consumer. Point to something worthwhile: Make sure that whatever your QR code points to provides real value to the consumer. Ideally, the landing page has a specific call to action and lead-capture mechanism. Make sure your QR codes are readable: Make them big enough for the context they will be used. This means about 175 pixels x 175 pixels for Web pages and e-mail, 10″ x 10″ for outdoor use (sign riders and car decals), and huge for billboards. Test them on your own to ensure they work correctly. The highlighted part of the URL was added before generating the code, and will separate the traffic coming in from that source. Your analytics package will show any traffic specifically coming from people scanning the QR codes in your print ads. There is nothing magic or special about the text that comes after “/?source=”; you can make it anything you want — just make sure there are no spaces and that it effectively describes where the code was embedded. At this point, you might be thinking, “Is this thing really necessary for my business?” If you want to be a leader in your market and really catch the attention and business of up-and-coming buyers, then yes, it is. Implementing QR codes is not about being a geek. It’s about staying up on things that matter to your customers and serving them in the way they expect. That’s more than a good technology or marketing strategy — it’s good business. The resulting QR code will point to the page it’s on. Unless you are comfortable working with HTML code, it’s probably better to give this to your Web designer to implement. Business 2.0, in its November 2006 issue, ranks the country’s real estate markets that are most likely to post the biggest home price gains by 2011. A small city needs one of two things to jack up housing demand: more people or wealthier people. Unlike the rest of Florida, Panama City hasn’t really attracted either, mainly because it’s isolated on Florida’s panhandle. The interstate highway system bypasses it, and the runway at the local airport isn’t long enough to support anything beyond regional jets. But now Panama City is poised to host big airliners, more visitors – and a lot more buyers. State and local governments and a top regional developer, St. Joe Co., are planning to build a new airport by 2008 at a cost of more than $300 million. Locals expect the new facility to open up the region the way Southwest Florida International Airport in Fort Myers helped drive a housing boom along Florida’s southwestern coast in the 1980s. “Panama City is an economy waiting to break out,” says Steven Cochrane, chief regional economist for Moody’s Economy.com. Other factors increasing demand: Property prices are still low by Florida standards, and the local market has already absorbed a price correction after peaking last year. Janet Roan, a Century 21 agent in Panama City, notes that two-bedroom beachfront condos are going for as little as $330,000 – down by more than $100,000 from 2005. CAUTION: Local politicians, notoriously cozy with builders, have green-lighted several master-plan communities for future development. If supply gets out of hand, prices will stall. Balmy weather, low property taxes, and a cost of living 3% lower than that of nearby West Palm Beach make this coastal town an affordable alternative, with sandy shores and the best surfing on the East Coast. “Vero Beach is at high risk in the short term but will move up in the long term,” Cochrane says. Here’s why: A Florida Atlantic University study says Indian River County and its two closest neighbors will need a projected 154,000 new homes during the next 25 years to house the growing population and replace old structures. A Manpower Employment Outlook Survey predicts growth in construction, manufacturing, and retail jobs too. Per capita income growth closely shadowed that of Martin County, Florida‘s second-wealthiest, and is gaining on that of Palm Beach County, the state’s richest. CAUTION: Projected job growth in the region will revolve mainly around lower-wage work, which can dampen home values. The last place you’d expect to find undervalued real estate is in tony Fairfield County, home to ultra-exclusive towns like Greenwich and Darien, where the Masters of the Universe retreat after a tough day on Wall Street. But a mere 20 miles up the coast lies the hardscrabble city of Bridgeport, which has long suffered from sleazy politics and urban decay but is finally cleaning up its act. The average home price is severely depressed – $280,000, compared with $840,000 in the county’s other large urban setting, Stamford. But the wealth is starting to spread: As more businesses have left New York for Greenwich and Stamford, more middle-class workers – entry-level professionals, executive assistants, and so on–have come too, and they’re keen to take advantage of bargain prices. CAUTION: The new demand is not organically driven by Bridgeport’s economy. If the New York business climate starts to slip, all bets are off. Aside from the panhandle and Vero Beach, few places in Florida scream out “buy now” like Lakeland. A house goes for a fifth less than the national median of $227,500, and Lakeland is just 30 minutes from Tampa, a juggernaut of 2.7 million people that’s projected to add almost 210,000 more residents over the next five years. Lakeland is the Greenfield – actually, orange and yellow, because of the surrounding citrus groves – that developers are divvying up to house many of those newcomers. Meritage Homes, one of the fastest-growing U.S. builders, plans to build more than 1,300 homes in the area by 2008. “All the big national and regional builders have moved into town,” says Larry Comegys, Meritage regional president. “Lakeland has become major.” It also sits along I-4, where the density of development is beginning to mirror the Dulles corridor in Virginia. CAUTION: Prices tend to top out more quickly in areas like Lakeland that are largely populated by semiskilled service workers. A Hispanic baby boom is working its way through the regional economy, and families will soon be trading up their digs. McAllen is already 85% Latino, and the average age of those households is two decades younger than that of non-Hispanic ones. He predicts that incomes will catch up to the area’s economic growth, currently more than double the state average of 2.9%. So far, cheap labor has driven a development boom. Manufacturers locate on both sides of the border to take advantage of low wages and the common market for goods created by NAFTA. CAUTION: As the economy matures, higher-paying industries like health care and business services will grow. The area could lose its low-wage “nearshoring” edge, slowing down industrial growth and the demand for new homes. SLO-Town, as the locals call it, is on the development fast track. It’s in the middle of the last semi-rural stretch of central California coastline, and it’s also home to the state’s rising star of wine production, Paso Robles, where even French vintners are buying property. The Median home price in Paso Robles has shot up by more than 100% since 2000. And according to local developer Peter Laughlin, commercial land has skyrocketed from $3 to $20 a square foot since 2001. CAUTION: Prices are already getting ahead of job and income growth. Nestled between the Cape Fear River and North Carolina’s Inner Bank beaches, Wilmington has great golf, mild weather, natural beauty, and a relatively cheap cost of living, all of which make it popular with both permanent residents and second-home vacationers. But it hasn’t always been this way. It was an isolated backwater until 1990, when the final 120-mile stretch of I-40 opened. Now the Research Triangle’s well-heeled tech workers can be at the beach in three hours. As the only city of any significant size on the North Carolina coast, Wilmington may be just at the beginning of its boom. It has a seaport, an international airport, and a UNC campus. But it has also maintained its “historic” ambience, bringing it another revenue stream: Hollywood has filmed 180 features here during the past two decades. CAUTION: Wilmington has seen a high proportion of speculators invade the region in recent years. Barron’s estimated last year that 38 percent of its homeowners are nonresident investors who use their properties only occasionally, if at all. One other word of warning: hurricanes. New Hampshire’s financial appeal is readily apparent: It has no income or sales tax, and it’s within commuting distance of Boston, one of the most expensive housing markets in the country. Manchester, a former textile mill town, is the largest city in northern New England; neighboring Nashua, which twice has won honors as Money Magazine’s “best place to live” in America, shares a border with Massachusetts, which has been losing population since 2004. And now may be a good time to buy, because appreciation rates started dropping in New England several quarters earlier than in the rest of the country. Prices are expected to burst upward again by mid-2007. CAUTION: It remains to be seen whether southern New Hampshire can buck the larger demographic trend: people leaving New England in droves to seek milder, sunnier climes. “Great schools, low crime, good jobs in a high-tech economy,” Money Magazine crowed earlier this year when it named Fort Collins its No. 1 small city. And talk about a lifestyle play: The city is an outdoorsman’s fantasy come to life, boasting 40 parks within the city limits, more than 60 miles of hiking and biking trails, three city-owned golf courses, and easy access to whitewater rafting, kayaking, fishing, and skiing. We are a company dedicated to excellence in customer support and the best education for our students. Since it's inception by Zack Childress, A.R.E.S. Publishing, Inc. has stayed mindful, honest, and caring of our students needs and wants. We aim to be the best at what we do, to help our students overcome odds and educate them to optain financial freedom.